Cashews are actually seeds that adhere to the bottom of the cashew apple on a cashew tree, native to Brazil. When buying cashews, you will only find them out of their shell—the shell around the cashew contains urushiol, the same substance found in poison ivy, and the inside of the shell contains a toxic resin. Therefore the nut must be safely removed before packaging. To avoid the resin from contacting the cashew, producers either steam the nut at a high temperature or boil in oil to open the shell. This process essentially cooks the cashew a bit, so although cashews may be labeled as raw, they are never completely uncooked due to this shelling procedure. They are, however, more raw tasting than roasted cashews. Raw cashews may be difficult to find, but roasted cashews are widely available. Roasted cashews are offered both salted and unsalted, as well as whole or in pieces. You will also find dry-roasted, meaning the nuts were cooked without any added oil. If you are watching your fat intake, choose dry-roasted cashews, as they have a lower fat content than any other nut. Cashews are offered in bulk and prepackaged containers. When purchasing from bulk bins, make sure the cashews are covered, and that the store has good product turnover to maintain freshness. You will find packaged cashews in a variety of containers--resealable and non-resealable bags, plastic jars, and foil-lined cans. When buying packaged cashews, choose vacuum-packed jars or cans over cellophane packaging as they will stay fresh longer. Whether in bulk or packaged, check to make sure there is no evidence of moisture or insects. Also look to see that the cashews are not shriveled, as this is a sign that they are past their prime. If possible, smell the cashews to ensure they are not rancid. When shopping for cashews you may also see them described as "cashew kernels," which is the same as the cashew nut. Cashews have high levels of two things: oleic acid and oil. The oleic acid gives cashews an edge over other nuts by boosting shelf life; cashews last longer than almonds and peanuts, for example. The high oil content (as with all nuts), however, makes them perishable and they can turn rancid quickly. Store cashews in a cool, dry place in an airtight container to avoid absorption of other food odors. At room temperature, they will not last long, but if you refrigerate them, they can last up to six months. Cashews may also be stored in the freezer for up to one year. 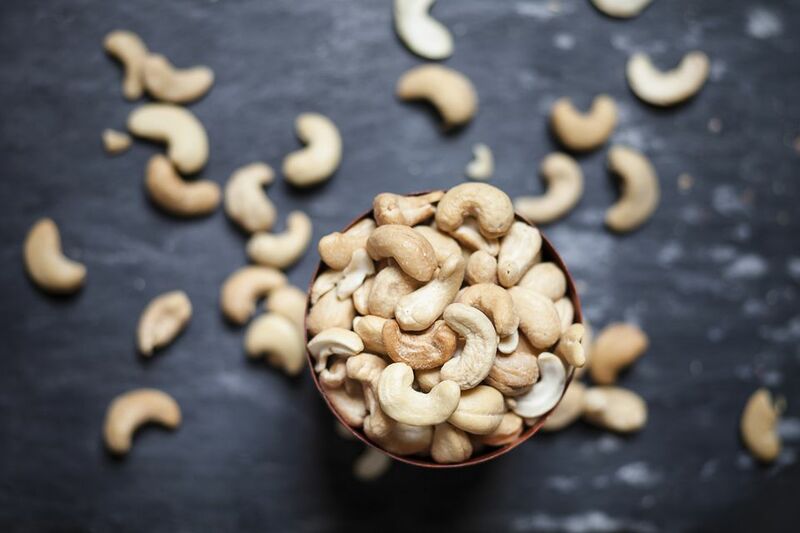 More than just a snack, cashew nuts are delicious added to recipes and blended into nut butter.